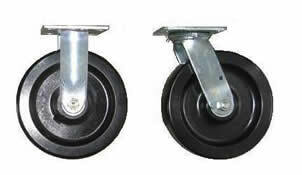 The Series 48-A-SP offers the industry standard plate and height for medium duty casters. This double ball race caster is recommended for use in variety of portable equipment. They are also excellent for warehouse trucks and dollies, portable racks and shelving, as well as for light duty tow lines. with a Bond American made wheel. Construction: 1/4" cold-forged steel provides strong top plate and fork assembly. Swivel Bearing: Hardened and polished steel balls in hardened upper and lower raceways assure easy swivel action and long service life. Axle: Threaded axle bolt secured with lock nut. Wheels: A full selection of wheels for any floor surface. Wheel Bearings: All wheels are available with straight roller bearings which consist of a split outer raceway with high quality hardened steel rollers held parallel to the axle by a steel retainer. A hardened and ground sleeve provides a precision inner raceway. Lubrication: Readily accessible pressure fittings to swivel assembly and to wheel bearings through wheel hub or axle drilled for oiling (optional). Finish: Durable corrosion resistant zinc plated finish. RIGID CASTER: Matches the swivel caster in all respects.